A "Support Our Troops" rally is scheduled for 5:30 p.m. Wednesday, April 23, on the north side of the courthouse in Lincoln. The gathering is intended to be much like the one that took place there following Sept. 11, 2001. A few speakers and music are planned. The event is being organized by a couple of mothers with children serving in the military. Nitsie Gleason submitted the request to the Logan County Board. The public is invited to come and bring flags and banners. The second annual plant sale by the Logan County Master Gardeners will be April 26 from 9 a.m. to noon, or until the plants are sold out, at the Extension office, 980 N. Postville Drive, on the northwest corner of the fairgrounds. No sales will be before 9 a.m. The group has over 500 plants, perennials, annuals and houseplants. How the world views America and its role in the war against Iraq will be the topic of the lecture given by political analyst Dr. Robert Seibert at 1 p.m. Thursday, April 24, at Johnston Center for Performing Arts at Lincoln College. The lecture is free and open to the public. Dr. Seibert is the chair of the Robert W. Murphy Professor of Political Science Department at Knox College in Galesburg. Seibert has published articles in Newsday and co-authored the book "Politics and Change in the Middle East." He is the resident political analyst for the NBC affiliate KWQC-TV in northwest Illinois. He serves on the board of directors for the Illinois Consortium for International Education and is a member of the Illinois Governor’s Joint Task force on International Education. He holds a bachelor's degree from Knox College and a master's and doctorate from Tulane University. Dr. Seibert says the lecture will give insight into how the U.S. is perceived by other nations around the world. "America is under a virtual microscope at this point in time, and they are watching us very carefully. The lessons that they draw from this war with Iraq will color our relationships with the rest of the world for a long time." Student government at Lincoln Community High School has been approached by Alan Feinstein, a leading philanthropist, who is offering 50 awards of $1,000 to the schools that collect the most canned goods. Our canned goods will be going to the Community Food Pantry. To collect the canned goods we are holding a competition between A and B clubs. We would like to earn this money for our school and at the same time provide a competition between clubs. We would also like to open this opportunity to anyone at LCHS and our community. 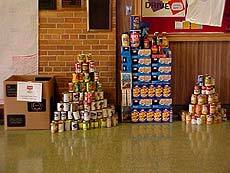 We would like your support in helping us reach our goal of 1,500 canned goods. Student government would really appreciate any canned foods you could donate. Please drop your canned goods by the front office. SPRINGFIELD -- The Illinois Environmental Protection Agency will sponsor 12 household hazardous waste collection events this spring, between April 12 and June 21. Collections in Springfield and Bloomington will be on May 3. "This program continues to be an important service to Illinois citizens," said Illinois EPA Director Renee Cipriano. "Each year, the Illinois EPA coordinates these collections with local co-sponsors. Since they began 1989, 262,100 households have participated in 292 events, with 53,765 drums of material collected." Local communities work with the Illinois EPA to give citizens the opportunity to rid their homes of unused or leftover household products that are potentially harmful. Citizens may bring oil-based paints, thinners, chemical cleaners, antifreeze, motor oil, weed killers, insecticides and pesticides, and similar household products. Citizens are encouraged to find alternative uses for latex paint since it is not considered hazardous. Fluorescent and other high-intensity discharge lamps may also be brought to the collections. Items not accepted include auto batteries (which should be taken to local recyclers), explosives, propane tanks, fire extinguishers, smoke detectors, agricultural chemicals and all business wastes. An Illinois EPA contractor disposes of the wastes in an environmentally friendly manner. The events are free to the public and are paid for by a portion of the statewide fees on solid waste taken to landfills. Logan County is on the waiting list to host a collection in the future. However, if residents wish to take to their waste products to one of the currently scheduled sites, they may. One-day collections are open from 8 a.m. to 3 p.m. on the Saturdays listed below. In addition, the following long-term facilities are available for disposal of household hazardous waste. Please phone ahead to determine availability and open hours. Lake County: The Solid Waste Agency of Lake County currently operates a long-term household chemical waste collection program. For more information and a collection schedule call (847) 336-9340 or go to http://www.swalco.org/. The Lincoln Rotary Club is currently looking for four host families for next school year, beginning this August. Rotary hopes to bring an international or foreign exchange male student into our community for the year, with the student scheduled to return home in July 2004. Each host family will have the responsibility of housing the student for only three months. In this way, four families will get to experience a life from another culture, and the student will get a slice of Americana from the perspective of four different family experiences. If you are interested in participating in this program, please call Bob Jeckel at 735-5372 or Lynn Laughlin at 735-1793. The city landfill will be open extended hours in April for disposal of landscape waste, according to Street Superintendent Don Osborne. Hours will be from 8 a.m. to 4 p.m. Monday through Saturday. There will be no Sunday hours. Baked turkey, stuffing, gravy, peas, salad, bread and butter will be served April 22 at 11:30 a.m. The reservation and ticket purchase deadline was Monday noon. April 21 is the monthly party date for all April birthdays. Bring a friend and join us at 1:30 p.m. to celebrate your special day. There will be games, entertainment and birthday cake. The featured speaker on Wednesday, April 23, will be Dale Voyles, Logan County Board chairman. Join the group at 9 a.m. to participate in a lively discussion of current issues. The van will be going to Bloomington on Thursday, May 15, to see “42nd Street” at the Community Players Theater. The ticket price of $18 for members and $20 for nonmembers includes transportation and show ticket. Reservation deadline is May 8. At the April 5 card party, honors for first, second and third place in rummy went to Ann Greger, Judy Morrow and Betty Burger respectively. Cheryl Lourrens, Sis Dehner and Betty Oltmanns won first, second and third place for bridge. Pinochle honors for first, second and third place went to Marian Buse, Chris March and Mabel Hoagland. Door prize winners were Pauline Aper, Grace McCrea, Thelma Davis, Mildred Hoffert and Kathleen Williams. The weekday pinochle winners were Henry Warnisher and Bernie Haley. Weekend winners were Larry Van Bibber for pinochle and Alice Thornton for pool. The Zonta Club of Lincoln's service committee has announced 2002-2003 projects for the organization. For over 40 years, Zonta Club of Lincoln's major fund-raiser has been an annual turkey dinner served the first Sunday in November. Monies raised support various service projects locally as well as internationally. Most of the funds are designated for local health career scholarships. This scholarship program was implemented in 1981. Approximately 50 area residents have benefited from the scholarship program and have become pharmacists, physical therapists, occupational therapists, dentists, a chiropractor and doctors. Don Sielaff, M.D., and Todd Nobbe, O.D., are two doctors who were scholarship winners and have returned to Lincoln for their practice. Zonta International is a worldwide service organization of women executives in business and the professions working together for the advancement of understanding, goodwill and peace. The Zonta Club of Lincoln has been in service to the local community since 1957. For more information on Zonta, visit www.zonta.org. [APRIL 19, 2003] Lincoln Rotary member Don Jordan has been bestowed with the Paul Harris Fellow award. The award is named after the founding member of Rotary International. Jordan received this honor for his contributions to the Rotary Foundation. District Rotary Foundation board member Liz Skinner from the Monticello Rotary chapter was on hand at a recent meeting to present the award. Tickets and brochures will be available beginning May 24 at Lincoln Christian Church, Jefferson Street Christian Church, Cookie’s Bakery, Central Illinois Bank, CEFCU, Logan County Bank, State Bank of Lincoln and Union Planters Bank in downtown Lincoln. [APRIL 14, 2003] Every year in April the Logan County Health Department celebrates Public Health Week. In connection with the April 7-13 observance, the local department presented two awards. The Goodwill Award was presented to Jackie Anderson of Senior Services of Central Illinois for her continued support of public health and the mission of the Logan County Health Department. This award is a certificate given to an individual, organization or business. The Partnership Award was presented to Lincoln City Police Department for their collaboration with the Health Department on projects and programs throughout the past year. These awards established by the Logan County Health Department recognize individuals, organizations or businesses that have supported and promoted the mission of the department in the continuation or advancement of its services or programs. Award recipients have collaborated with or assisted with existing or new programs, projects or services of the department. 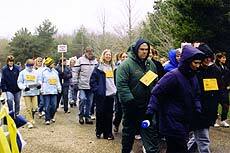 [APRIL 9, 2003] Despite bruising winds and temperatures of 35 to 42 degrees, the fourth annual MS Walk was a rousing success! Over 100 walkers and volunteers stepped off, led by Tom Seggelke of Key Printing, a longtime supporter of the walk, and turned in approximately $15,000. Walkers came from Mount Pulaski, New Holland, Hartsburg, Middletown, Normal, Maryville, Pawnee, Rushville, Lincoln, Elkhart and Murray, Ky.
DJs Joe, Greg and Josh Hackett provided music and announcements while walkers gathered for the event. Twanna Edwards of Bloomington inspired the walkers with her beautiful rendition of "God Bless America" as the people started. Also, a moment of silence was held in support of our service men and women. In addition to the amount turned in by the walkers, additional funds totaling approximately another $4,000 were received from businesses, corporations and others interested in finding a cure for this disease. Several local businesses also furnished prizes for the walkers. The almost $19,000 total is a record for the Lincoln MS Walk. The money raised on this and other walks in Illinois will help toward the cure and many programs for those with MS and their families. Multiple sclerosis is a disease that usually strikes young adults between 20 and 50 years of age. It is a chronic disease of the central nervous system, affecting the brain and the spinal cord. It comes and goes unpredictably. The local committee members, led by Jim and Nancy Ireland and Jennifer Kracaw, are most grateful for all who were in any way a part of this successful occasion.